The gas and water injected with it push the oil towards the producer. All gases do these things. Which gas to use depends mostly on which is available and most profitable. 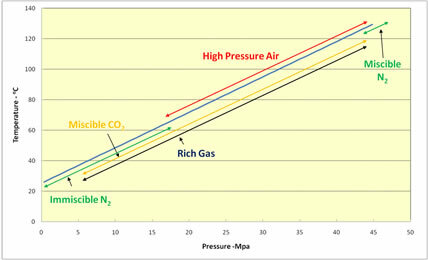 The following figure illustrates the pressure and temperature ranges in which several gasses are used. Starting from the left, immiscible nitrogen is mostly used in low pressure and temperature reservoirs to maintain pressure. At slightly higher pressure CO2 might be miscible with the oil. CO2 is used interchangeably with rich gas (containing extra natural gas liquids) where there is stranded gas that cannot be sold. If neither rich gas nor CO2 are available, nitrogen is often used. High pressure air injection (HPAI) is mostly used if the temperature is above 70°C, or if the injection area can be heated to that temperature. This temperature is important because many oils spontaneously combust when they are hot, and the air becomes energy, steam and flue gas. High pressure air injection is mostly used for light oils (also called light oil air injection – LOAI) but also works well for heavy oils if water is coinjected with the air to create more steam. Then it is called in-situ combustion (ISC) or wet in situ combustion. At high temperature and pressure nitrogen might be miscible with light oil. Any mixture of gases can be used for EOR. The limitation is simply whether the gas is available, safe to use and profitable. The gases in the previous figure are labeled immiscible and miscible. This really means somewhat soluble and extremely soluble and reflects how much the viscosity of the oil is reduced as well as how much the volume increases. The two pictures below illustrate what an immiscible and miscible displacement look like in glass microvisual models at 17 MPa (2,500 psig). The gas in both cases is CO2. The temperature is 75°C and the oil has an API gravity of 28 in the immiscible photo while the temperature is 40°C and the oil is 40 API gravity in the photo on the right. 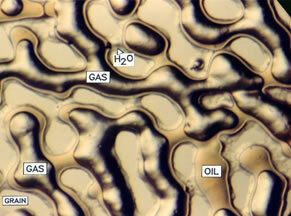 Gas forms channels through the model in the immiscible displacement. Gas dilutes the oil so much in the miscible experiment that the liquid is clear and there is no phase boundary between the bypassed oil as there is in the immiscible experiment. 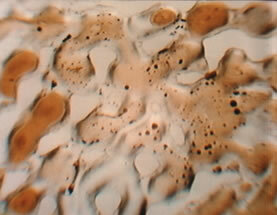 Miscibility is determined by temperature, pressure and API gravity or molecular weight of the oil. The following figure illustrates how the MMP (pressure at which 90% of an oil is recovered), changes as a function temperature and molecular weight of the oil. 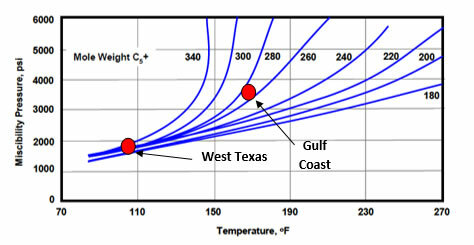 The West Texas example is the miscible photo, while the Gulf Coast example is the immiscible photo. This figure teaches that CO2 is less soluble in higher molecular weight (lower, API gravity) oils and that these oils are technically immiscible with CO2. However, oil recovery in a displacement experiment only increases from 80% to 90% for the Gulf Coast example as it becomes “miscible.” So, miscibility is only a question of degree of swelling and viscosity reduction. A figure like the one above could be created for any gas listed in the first figure. For example, the West Texas oil is “miscible” with reservoir gas, but there isn’t enough cheap rich gas, so less expensive CO2 is used.